May I Share These Hiking Tips? Hello to you, dear hiker! Welcome back, or a heartfelt welcome if this is your first issue of Happy Trails. Lots of great stuff in here to help you achieve your hiking goals, including new gear reviews, tips on how to be a Force Of Nature with women designed gear, an app for birders, and a few solar connections. No sense spending any more time on an intro, let's dive in! Have you noticed that REI, the Seattle based outdoor gear co-operative, is shining their really big headlamp of media attention on women's hiking gear that is designed and tested by women? They call it the Force Of Nature campaign. It's not like getting more women onto a trail is a new idea. But REI decided to throw some of their considerable weight behind the problem of finding high quality gear to fit our curves. To help this campaign reach hiking women, I outlined the ways in which female designed backpacks, boots and socks can help you conquer the forces of nature that interfere with your comfort and safety on the trail: gravity, compression, and friction. If that gear seems right for you, now is a smart time to get the goods during REI's Anniversary Sale, through May 29th. Everyone can save up to 30%, and REI members get two additional coupons to use for rounding out a gear list: 20% off one full-price item and 20% off one REI Garage (already discounted) item. If you purchase through the REI link below, Hiking For Her will receive a small percentage of your purchase price while you pay nothing extra. 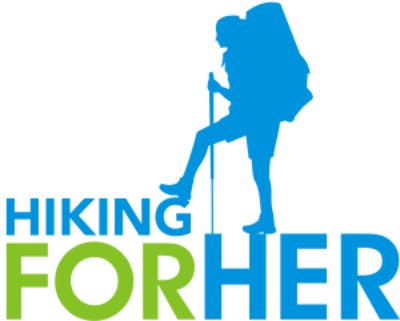 Thanks for your support of a woman focused hiking site! Hiking For Her sets a goal of doing at least one new gear review each month. This month was a record breaker: three new reviews for you! Treat yourself to some in depth hiking tips grounded in science and trail time. You're so worth it! 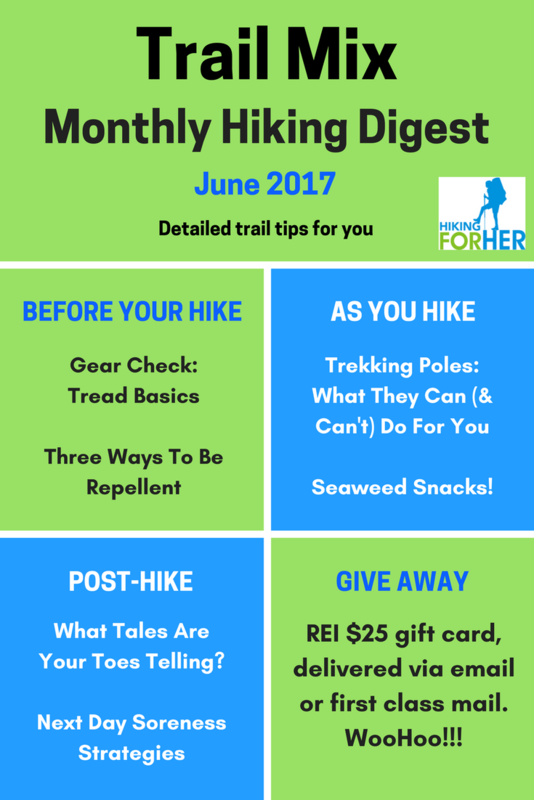 Click on the Trail Mix graphic below to discover exactly what a monthly hiking digest is, and to purchase your instant download pdf copy. Readers are saying very nice things about Trail Mix. And what's not to love about a chance to receive an REI $25 gift card? The secret password for entering the drawing is available inside this issue! Here's what's special about Trail Mix: all of the articles are created exclusively for readers to provide solutions to common hiking problems and concerns. These are not fluffy little tips like "bring water on a hike". Instead, you'll learn a lot about how to take great care of yourself before, during and after each hike. Nutrition tips, new trail techniques, unique solutions to the challenges of hiking in a human body - it's all in there! "I received the goody box today and was so surprised! So generous - much more than I expected, and I'm anxious to try everything...I do thank you so much!!!!!!" It's not too late to enter for your chance to win the May Trail Mix giveaway. The deadline for sending in the secret password is May 31, 2017. You are a solar powered hiker, turning food energy into muscle energy. Now, you can turn that muscle energy into electricity to charge your batteries on a hike. StepCharge is developing insoles and hiking shoes to do just that. What do you think of this idea? Is it practical? Are you looking forward to the the August 21, 2017 total solar eclipse? It's the first one in a long time to have a "path of totality" crossing 12 states in the U.S. The above link will also satisfy your curiosity about how close to its path you are. Or aren't, as in my case. Which is why I'm planning to watch the live stream video as part of my Solar Eclipse Party. Have you seen the very useful IOS app for hikers who tune into the bird calls and songs of the trail, but don't know the identity of the songster? Just record the bird you hear, and the app will give you the top three matches for your location. This is great for beginning birders, although intermediate birders will find it valuable when they travel to other parts of the U.S. It's also helpful during song bird migration (ending just about now in North America). I'm not affiliated in any way with the creators of the app, I just think it's a fun and easy way to get to know who is sharing the trail with me! If you're already into birds, you'll recognize the name David Sibley. He created the beautiful artwork for the app, based on decades of birding experience and his passion for the subject. June 3, 2017 is the day Americans celebrate their freedom to hit the trail, thanks to an event created by the American Hiking Society. Why not take some photos of your next hike to share? You can post them, along with a brief description of why your hike was enjoyable, on Hiking For Her's Share Your Hike page. You may not realize how inspirational your words are to hikers who are just beginning, or even just beginning to think about hiking. This is an easy way to encourage people you will never meet to literally take that first step onto a trail. Consider it your good deed for the month! And thank you for sharing your trail wisdom. I appreciate your enthusiasm for hiking, and send you my best wishes for happiness on the trail throughout the month of May and into June. As always, please feel encouraged to send your comments, thoughts, and suggestions. I read, appreciate, and respond to every message.